Train Stuttgart to Amsterdam catch train @ 2:28am arrive 10:44am. Check out 11am & check in nearby (normal hotel) for 3 nights. Keukenhof (will go on bus tour rather than going ourselves. Duration: 5 hours bus tour departing @ 9am ). PS: Also, we will want to go for at least one canal tour in Amsterdam and since there are many of them in the central location which one would you recommend to go? Or just any of them will be just good? Instead of Zaanse Schaanse, visit Kinderdijk, 19 windmills in place where they worked for years. Train Amsterdam to Rotterdam, Tram7 to watetbus to Kinderdijk. Walking paths among them and one is a museum. For other towns to visit or stay in look at Haarlem, Delft and Leiden. Giethoorn is quickly getting an over-popular destination. With some bad luck the small village is crowded with coach parties. Instead go to Hoorn and/or Enkhuizen, both very attractive historical port cities. Easy to reach from Amsterdam on half-hourly direct trains, which take half an hour to Hoorn and another half an hour to Enkhuizen. Sounds like an excellent itinerary! You will enjoy Keukenhof Gradens. Zaanse shans is nice, especially if you want to taste and purchase excellent cheeses; Kinderdijk windmills are worth trip. Enkuizen is very interesting and worthwhile. Posters from the Netherlands are reliable on their suggestions (IMO) as are they are up to date on the latest happenings in their country. If you are looking for a fabulous dinner, consider Martine's Table. Thanks for the comment and feedback guys. Then we might go to Haarlem after Keukenhof since it's on the way back and as much as we love to go Kinderdijk windmills, I don't think we have enough time and plus I heard it's quite difficult to get there opposed to ZS unless we are staying in Rotterdam in which in this case, we will not be for this trip, maybe next time! Actually, I am thinking whether I should shift the activity on the other way instead? i.e. Which one would you think suits us better? Because I am not sure realistically, how long Utrecht & Zaanse Schans is needed anyways? And for Giethoorn , I assume it's the whole day? Because we plan to depart morning @ 7am and come back at night? Or it's too long since the town is small? I'd do the Zaansche Schans as a half-day trip on the 26th. It is a 20-min train ride (station Zaandijk-Zaansche Schans) with 4 trains per hour, and then a 15-min walk from the station (see map). With two hours you'll have seen most of it. 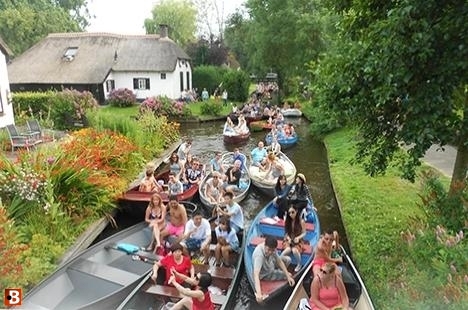 Giethoorn is a village, the main attraction of which is a boat trip along the waterways. Not very attractive in bad weather, and with the risk of some bus loads wanting to do the same thing, giving situations as depicted here. I guess the bus trip will take around 2 hours to get you there and another 2 hours back to Amsterdam. Make it an easy day trip to Enkhuizen. Trust me and others: you'll love it. In a lot of European cities, supermarkets are closed on Sundays. .. but not in larger and medium-sized cities in the Netherlands. You mention going to Haarlem after you tour Keukenhof, Haarlem is a nice sized town and quieter than Amsterdam with lots to see and do. Great walking, great restaurants and canal boat rides. Are you thinking of going back to your hotel in A'dam after visiting Haarlem? If you are interested in a wonderful restaurant in Haarlem, I can give a recommendation. Flamboyant restaurant. I had a wonderful Indonesian dish there last April. By the way, I am wondering if taking a tram for Route 2 is it worth the round trip?? Because I saw on the site saying "According to the the National Geographic Traveler magazine, route 2 in Amsterdam is one of the most beautiful in the world.". Yeah, we plan to go to Haarlem after Keukenhof since its on the way so we will buy that travel pass that includes the tram/train/bus and its on the way anyways since the bus drops you off there. If we start Keukenhof at 8am, I estimate we finish by 12-1pm, so we still have like 6-7 hours of daylight. We will go back to Amsterdam hotel at night which is booked and thanks for the recommendation for the restaurant of Flamboyant restaurant, we will note that down and take it as reference!